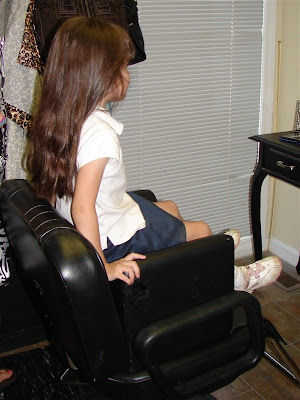 donating our hair to Locks of Love. don't have hair and need special wigs made for them. get it cut and donate it to help someone who needs it. So today, we cut out hair. 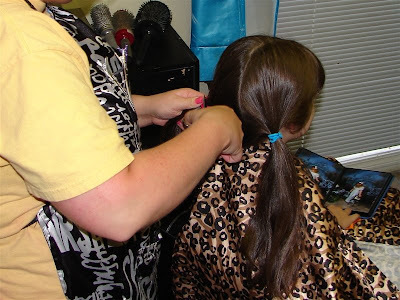 We had two great hair stylists, Holly and Tiffani. Holly cut my hair and Tiffani cut Rachel's. since we are both blessed with extra thick hair! I was first and I was nervous. I told Holly I wanted the minimum, ten inches, cut off. I could see that it was going to end up being a lot more. was significantly shorter than the other. 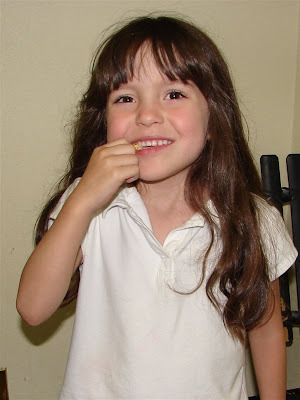 she kept asking, "Are you cutting it now? Is it gone?" 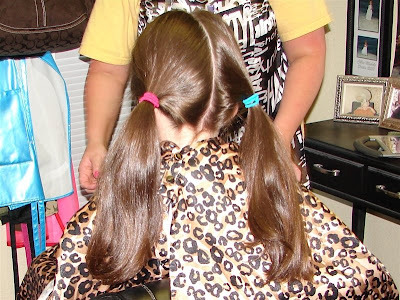 Here is Rachel with her tails cut off!!! After the cut, we were treated to the spa treatment. We both got our hair washed. 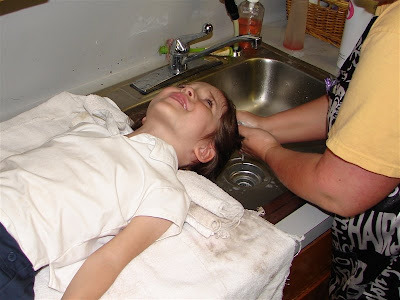 Rachel had never had hers washed at a salon before. 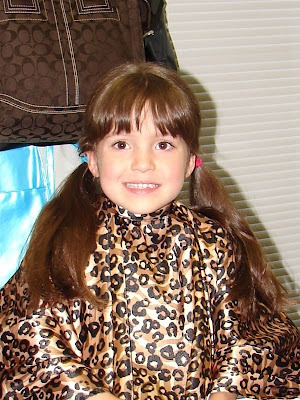 Rachel loved having her hair washed. She said the shampoo smelled like grape nerds. to get any water in her eyes! so it was a surprise for us to see what the other looked like. Rachel loves, Loves, LOVES her new shorter hair. 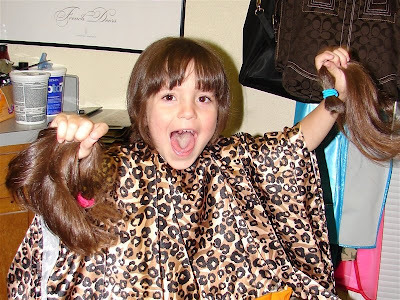 She was so bubbly after she got it cut. jewels on them to set it off. Talk about making her feel like a princess. so Tiffani asked if she could paint her nails. Wow, she got the full treatment, manicure and all!! 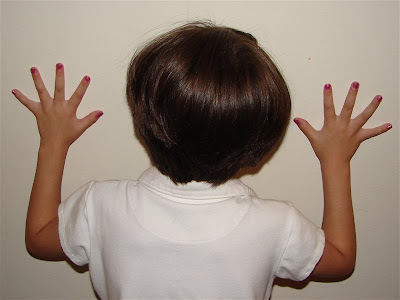 Here she is showing off her nails and the back of her hair. As for me, well...it's ok. It is a WHOLE LOT shorter than I have EVER had it. but she had to cut quite a bit more off. this hairstyle is really popular now! Don't know if that made me feel any better or not. It is cooler and that will be nice this summer. And it will grow back out. me and Rachel looked like Granna!! That's my mom, for those that don't know her by Granna. 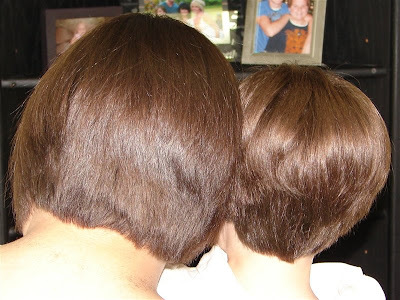 We both had the required ten inches for Locks of Love. My bag of hair is a little heavier than Rachel's bag. someone out there that needs some hair. I feel good knowing we are helping others. And I enjoyed doing this with Rachel. including cutting ALL your hair off!! Wow! How very sweet and generous of both of you sacrificing your hair for charity! What a big change! You both look great with short hair! I'll bet it's so much easier to manage and take care of now! Were you two nervous? That was very brave what you and your daughter did! I was just curious are those bobs you guys both got? Bob haircuts are so cute and stylish these days! I know you've already taken a lot of pictures, but I would love to see even more additional pictures of your new haircuts! They're just so cute and stylish! Thank you!!! Such a great, caring thing to do! You two are just so sweet! Love the new haircuts! You should have taken more pics of your new haircut! It looks really great! Good for you two! 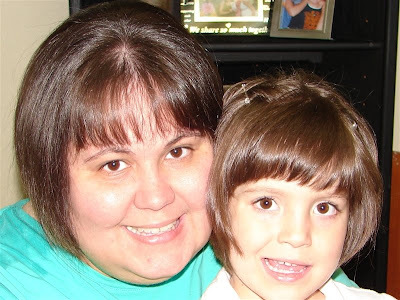 You and your daughter look great with short hair! For such a good cause! Were you guys nervous? 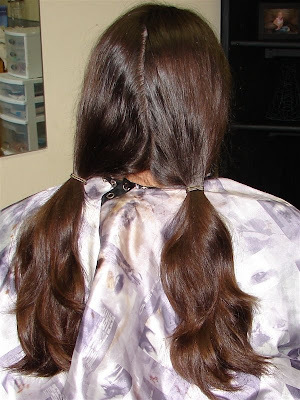 Are you going to keep it short or grow it out again for locks of love? I'd also love to see even more additional pictures, too! Wow! You two cut your hair really short, didn't you! It must feel good to have short hair! More after pictures of the new haircuts, please! How wonderful you both did that. I don't think I could. If my hair even gets the least bit too long (i.e. longer than yours is in your after picture) I nearly rip it out with my own hands! So an extra 10 inches? Yeah, not gonna happen! You guys both look great!! Well, if I get brave, I'll try to pretty myself up and take a few more of my haircut. I think I would be open to growing it again for donating, right now I'll just be happier if it grows a little more! 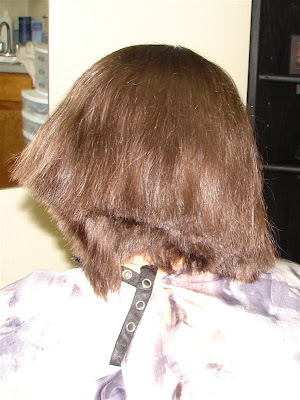 Oh, and the stylist said we both got the stacked bob style. So...check back for more after shots of me. 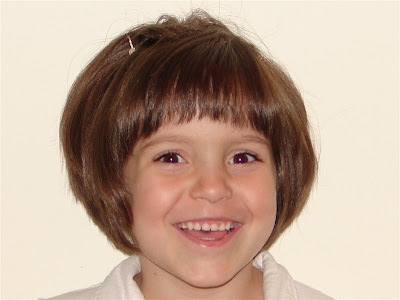 I'd also love to see more after shots of your daughter's new haircut too! It's just so cute and stylish! Thank you! 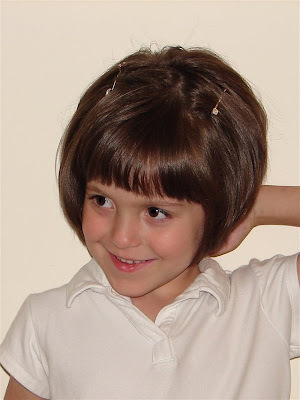 Yeah, I'd love to see more pics of your daughter's haircut, too! She must have been very brave to do such a courageous thing!!! OK ladies, I've posted a new post with another photo of Rachel! Enjoy!